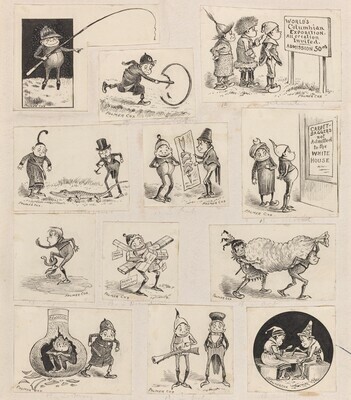 each vignette signed: PALMER COX; in unknown hand,on mount, upper left: Brownies Contents / 6522 / x; across bottom: Reduced to 5 3/4 in in width / ... Home. Hatch, John Davis. 100 American Drawings: Loan Exhibition from the Collection of John Davis Hatch. London: Heim Gallery, 1976, no. 85.